Nearly all articles you might look for regarding trying out an MLX90614 with an Arduino contain examples of using one sensor at a time. This makes sense as probably 99% of people are going to prototype a system with only one sensor in it. Quite a few articles make the incorrect assumption that having more than one sensor in a circuit is not even possible because the device slave addresses are hard coded. They do all come out of the factory with a default slave address of 0x5A , but this can be changed with a small amount of effort. Now I plan to use two of these MLX90614 sensors in my cloud detection project so there was no two ways about it - I need 2 sensors, hence two slave addresses. Below I am going to take a look at the code to change the slave address on one of these devices, and then a way of actually implementing the change. After some research on the net I came across this forum post which proved to be very helpful indeed. It was posted by a user called paulrd about whom I've not been able to find any other information. Owing paulrd a debt of gratitude I am reproducing the code here in a slightly modified form. // 8 bits and adds the low byte. When it comes to choosing a new address for your sensors, you will find that you have quite a wide selection of possibilities. 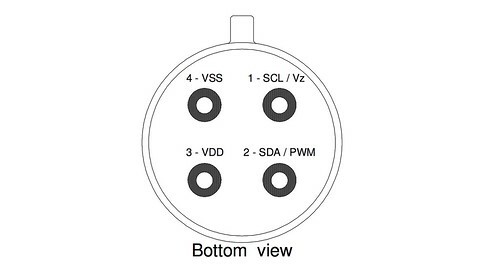 The Melexis MLX90614 Datasheet states that "the SA feature allows connecting up to 127 devices (SA=0x00...0x07F) with only 2 wires". I have experimented with a number of different addresses between 0x00 and 0x07F without a single problem. Just be aware that most libraries for Arduino refer to the factory default address of 0x5A. 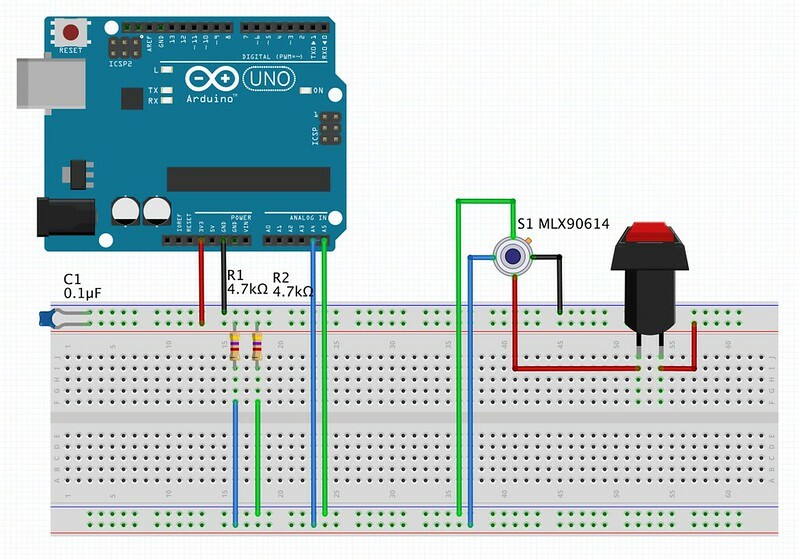 The first thing to do is to connect the Arduino and MLX90614 in a circuit, such as in the picture below. I won't go to any lengths to explain it . Please note that pin 1 on the device (SCL) leads to A5 on the Arduino; pin 2 (SDA) leads to A4 on the Arduino - I have made the mistake of mixing these two up more than once. Other than the preceding point, the layout is standard for such devices and there are many other places on the net which will extemporise on these matters. The only thing of note is that during the program run you will have to recycle the supply voltage to the MLX90614. Some people (like me) just pull out and then push back in a wire in the breadboard; others with more time to spend put an NC push switch on the supply to the sensor - as pictured above. Do whatever you feel is necessary to get the job done. One note of caution - when attempting to change addresses do not have more than one MLX90614 on the circuit at the same time. Next, upload the program above to your Arduino and run it, being ready to pounce with that wire or push switch during the 10 second pause. One last item to note is that if at some point you end up with a pile of these sensors whose addresses you have forgotten because you changed them and did not note it anywhere, do not panic. The universal address (0) will allow you to access the individual device in order to change the slave address again or whatever. Except for the following addendum!